Stunningly convenient to display, these Five Celestial Guardians are an essential remedy for form and landscape feng shui ("luan tou"). Popularly known, the four celestial guardians are the green dragon, white tiger, black xuan wu and red phoenix, each guarding one cardinal direction (north, east, south and west). Rarely known is the fifth celestial guardian Chilin which is guarding the center. Classical masters always insist that there are five directions instead of four. According to them, the center itself is a direction and the most important of all directions. Therefore, the Five Celestial Guardians makes the "luan tou" protection more complete. Displaying them symbolically in their own directions will watch over and balance the "chi" of the five directions of your property. A fundamental requirement, a balanced "luan tou" is the basic that will prepare you towards doing up the feng shui and preparing for the well-being of the occupants. When all directions are in harmony, it encourages the dragon's breathe (lung chi) to settle, thus creating an inflow of auspicious energy. They will also look after family safety, prevent dangers and regulate your career, wealth, health, power and fame. They are also essential to correct any external landscape problems and internal missing corners. Note: This pieces are energy infused and emit energy unendingly. They come with a certificate of authenticity and a free gift box. What the Five Celestial Guardians symbolize and how to display? Ideally, for excellent feng shui, the landscape of the surrounding is the most important factor to be considered before looking into the flying star system of a building. If the landscape is bad, the feng shui can never be good no matter how good the flying stars are. Remember that feng shui is first and foremost a tradition tied to the land. The relationship of the feng shui practitioner with the land is the expression of bond, of understanding the flow of energy in the earth and cooperating with it. By listening to the earth, you become attuned to the energy of the universe. To cure such problems, this set of five celestial guardians are the best symbolic replacement of perfect landscape for city dwellings today. 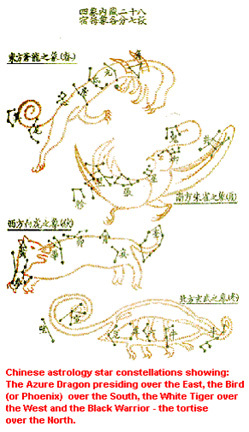 The chinese astrology studies have shown that the location of dragon is at the east, the phoenix in the south, the tiger in the west and the xuan wu is in the north as shown below. In olden days, all houses in China were built to sit north and face south. This is to avoid cold winds coming from the north to enter the main door. The back of the house should be protected by mountains or using trees as shields behind the house. They would also carefully analyze the landscape for the presence of Dragon's Breath for shapes that reveal the Yang Dragon and the Yin Tiger. They would examine the landscape where the dragon and the tiger meet. This is where sharply rising Yang Dragon merges softly with the undulating Yin tiger ground.The Dragon brings upon the essence of life, in the form of its celestial breath, known to many as "sheng chi". Then the front of the house should have a wide open space and a low land to represent the phoenix. Of the five, the green dragon is the most prominent and significant. The dragon epitomizes the emperor, signifies heaven, and is the most celestial of all creatures. Having the dragon attracts good "yang" energy into your home. Having it in your home will benefit you hugely for success in every area of your life. It brings you wealth, business luck and many filial children. The dragon should be positioned in the east of the living room. Alternatively, you can also have it on the internal left-hand wall of the house (inside looking out towards your front). The white tiger on the other hand will protect the household from any harm. Its presence will especially benefit politicians and high ranking officials. It constrains the negative, and balances the Dragon’s power. It symbolizes passive energy and protection against evil intentions. It should be positioned in the west of the living room. Alternatively, you can also have it on the internal right-hand wall of the house (inside looking out towards your front). The xuan wu is as important as the dragon, and its presence will benefit you in your career. It gives promotions, a good job and smooth business undertakings. 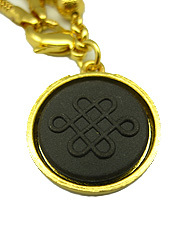 It symbolizes longevity, strength, endurance, support and stability. It protects home from everything negative. Its position is in the north. Alternatively, you can also have it on the back wall of the house. The red phoenix brings you fame, recognition and public success. It also stands for rebirth, success, recognition and new opportunities. Its position is in the south. Alternatively, you can also have it on the front wall of the house. The chi lin is a fabulous heavenly creature of good omen, and the symbol of grandeur, felicity, wise administration, longevity and illustrious offspring. It had attained the age of 1000 years old and said to be the noblest form of animal, emblem of perfect good incarnated essence of Five Elements. The predominant characteristics of the chi lin is its perfect goodwill, gentleness, and benevolence to all living creatures. It possessed all the good qualities found in all animals and has the head of a dragon, scales of the carp and body of a horse. It brings good fortune. Its position is in the center. 1. The phoenix in the front portion of the house. 2. The xuan wu in the back portion of the house. 3. The green dragon on the left portion of the house (inside looking out). 4. The white tiger on the right portion of the house (inside looking out). 5. The chi lin in the center portion of your house.